Guests are provided with a welcome drink upon arrival. They can also enjoy a cocktail at the bar, or benefit from the 24-hour room service. The Main restaurant serves reinterpreted famous, traditional dishes, accompanied by a wide selection of wines from all around the world. The spa area features a hot tub, a sauna and a Turkish steam bath. The state-of-the-art fitness studio also has cardiovascular equipment, and massages will be provided on request. 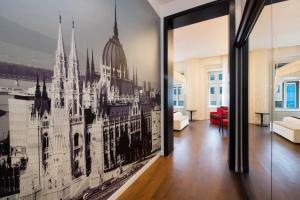 Guests can reach St. Stephen’s Basilica within a 2-minute walk. The Vörösmarty tér shopping and restaurant district and the State Opera are 800 metres away. Budapest Airport is 17 km from the hotel. Please be informed that payment is due upon arrival. This room offers views of Liberty Square or the nearby street. All come with a flat-screen TV. Coffee and a selection of teas are offered. Bedding setup can be 1 double bed or 2 single beds pushed together. Bedding type and view can only be confirmed upon arrival. Please note that extra beds are not available in this room type. Rate: € 116.64 ... € 217.80; select dates below to get current rates. This room offers views of Liberty Square or the nearby street. All come with flat-screen TV. Coffee and a selection of teas are offered. Bedding setup can be 1 double bed or 2 single beds pushed together. Bedding type can only be confirmed upon arrival. This room provides city views and has a flat-screen TV. Coffee and a selection of teas are offered. Bedding type and view can only be confirmed upon arrival. 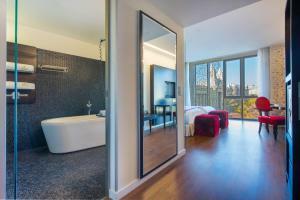 Facing the inner courtyard, these units feature a private bathroom with a shower. Bathrobes and slippers are provided. One unit is suitable for guests with a disability. Coffee and a selection of teas are offered. Please note that extra beds are not available in this room type. This room offers views of the Liberty Square or the nearby street. All units come with a flat-screen TV. Coffee and a selection of teas are offered. Bedding type and view can only be confirmed upon arrival. Please note that extra beds are not available in this room type. Rate: € 114.21 ... € 244.00; select dates below to get current rates. This room offers views of Liberty Square or the nearby street. All come with a flat-screen TV. Coffee and a selection of teas are offered. Bedding type and view can only be confirmed upon arrival.